Get out the pen and paper, Browncoats. The Firefly roleplaying game core book is ready to fly off into the Black. Margaret Weis Productions announced yesterday that the digital edition is now available in PDF format from DriveThruRPG.com. The release date for the print edition will be sometime in mid-April. The book has shipped to printers and the release date will be confirmed once the books arrive in warehouse. The RPG uses the Cortex Plus rule system and is compatible with the Echoes of War Firefly adventures, released separately. The core rulebook includes a detailed episode guide for all 14 episodes of Joss Whedon's Firefly television series. 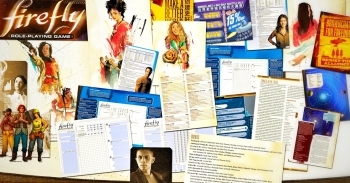 The book includes over 30 pre-generated characters, including the Serenity crew, and instructions for creating original characters. A playable scenario, maps of the 'Verse, and a Chinese teaching tool (including phrases from the show) are also included. The game was demonstrated at GenCon 2013, and fan comments were used to improve it. Monica Valentinelli, Firefly RPG Brand Manager and Lead Writer, says, "Thanks to you and your feedback, we fine-tuned the 360+ page Firefly RPG, implemented printer-friendly pages, added interactive Crew and Ship sheets, and jam-packed it with examples and information you requested." Margaret Weis Productions announced the Firefly tabletop RPG in February 2013. The company, headed by bestselling fantasy author Margaret Weis, publishes tabletop roleplaying games and has licensed games for the worlds of Dragonlance, Supernatural, Battlestar Galactica, and many others. In the release date announcement for the Firefly RPG, Weis says, "For years, Browncoats have been coming up to me at Gen Con and writing to me on Facebook asking when Margaret Weis Productions will publish another Firefly RPG. The day I posted on Facebook that we had acquired the license for Firefly from Fox, my Facebook page got more "likes" than any time before or since. I am so pleased that now the day is almost here when my crew and I can bring you more Firefly heroes and villains, spaceships and mules, horses and guns and, of course, more swearin' in Chinese. Without fan support, this would not have happened!"